It’s after Thanksgiving, which means it’s finally officially Christmastime! It’s time for Christmas music, Christmas cookies, and Christmas movies! One of my favorite Christmas characters has always been the Grinch. Not only is he a unique character in terms of personality, but I also think he has a fun design. 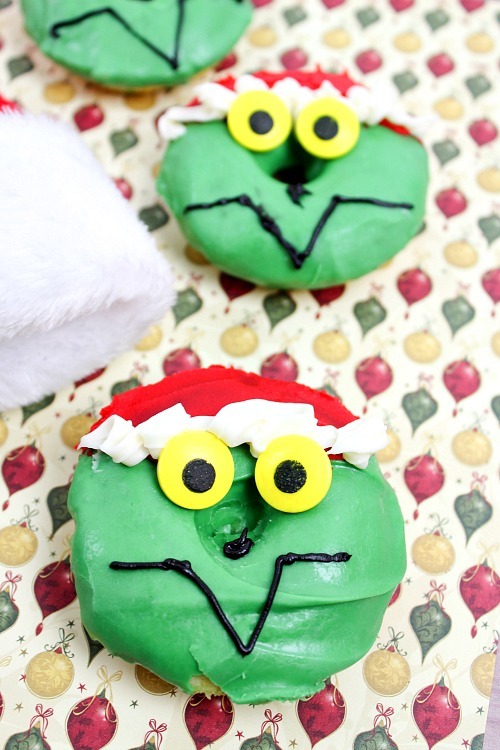 So this year, I decided to Grinch-ify some desserts and made these Christmas Grinch Donuts! 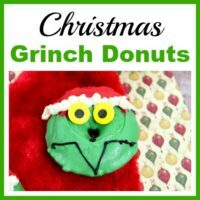 It doesn’t matter if you prefer the animated Grinch movie or the Jim Carrey live-action Grinch, if you’re a Grinch fan, you’ll like these donuts! 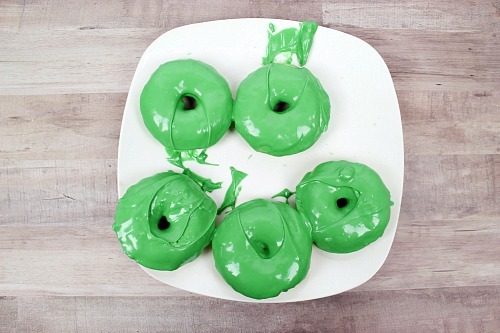 Actually, if you’re just a donut fan you’ll like these, because they’re very tasty, even without the fun Grinch decorations! 1. 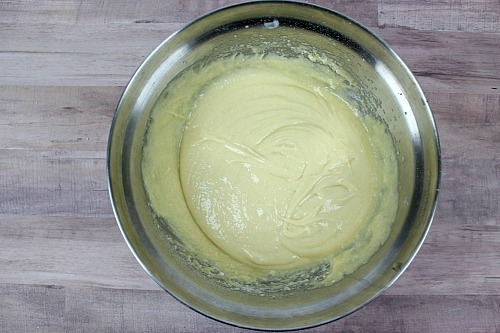 Mix together cake mix, water, vegetable oil, and eggs according to the cake mix box. 2. 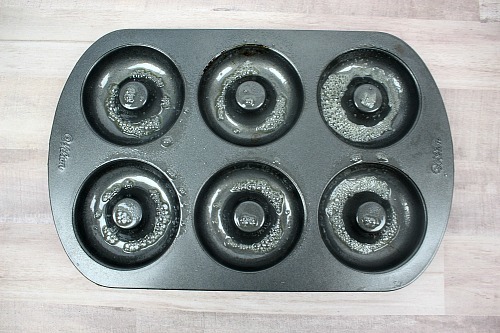 Spray donut pan with cooking spray. 3. 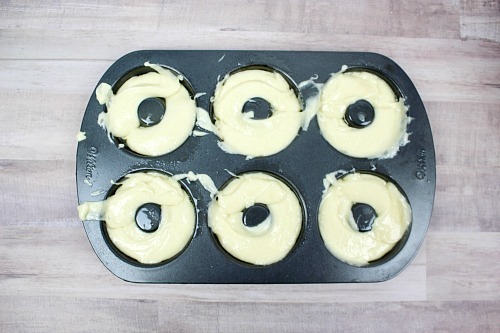 Pour the donut mix into the donut pan. If you fill over the center hole, it’s okay as you’ll be covering it! 4. Bake for 15 minutes at 350 degrees. 5. Let cool for 5 minutes. 6. Melt the green candy melts in the microwave for 2-3 minutes at 50% power, stirring every 30 seconds. Or use a Wilton Melting Pot. 7. 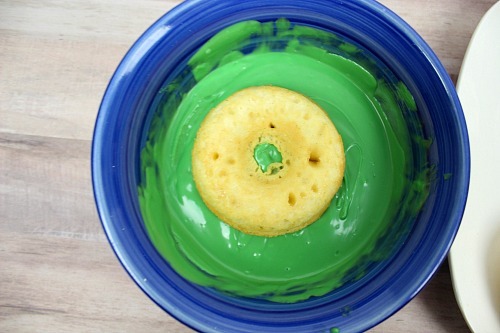 Dip the top of the donuts in the green melts. Let melts harden – usually about 5 minutes. 8. 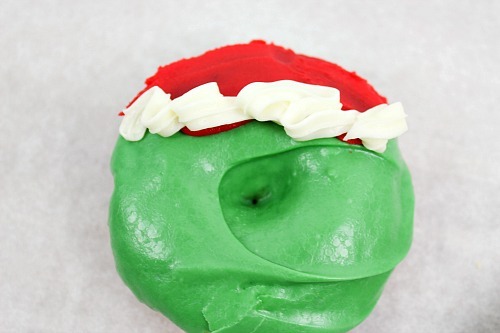 Use red frosting to ice the Grinch’s Santa hat. 9. Use white frosting to frost a line to be the brim of the Santa hat. 10. Place 2 yellow Wilton eyes right below the white brim of the Santa hat. 11. Use your black decorating frosting to make a small dot in the center as a nose and a V below that as the Grinch’s mouth. Let set for 5 minutes, then enjoy! 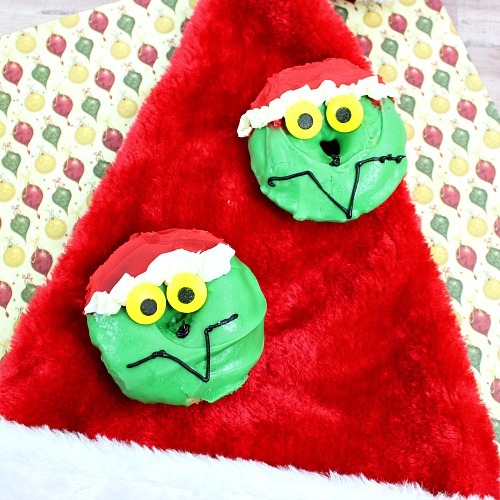 Decorating these Christmas Grinch donuts is so fun and easy, why not have the kids help out? And afterwards, you can have a Grinch movie watch party! Why not show your kids the animated and live-action versions and see which they like best? Have you made any other character themed desserts this holiday season? 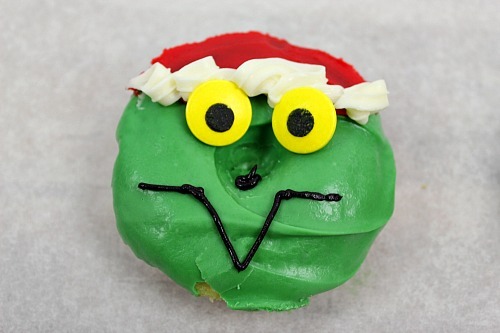 Give your homemade donuts a Christmas-y twist by turning them into fun Grinch faces! 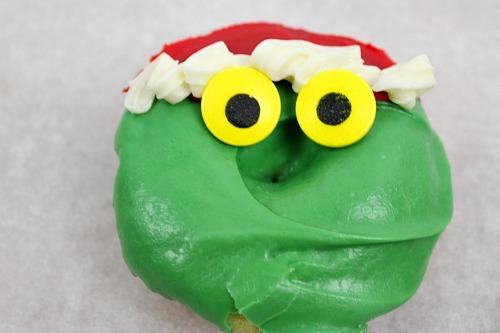 Here’s how to make your own Christmas Grinch donuts! Mix together cake mix, water, vegetable oil, and eggs according to the cake mix box. Pour the donut mix into the donut pan. If you fill over the center hole, it’s okay as you’ll be covering it! Melt the green candy melts in the microwave for 2-3 minutes at 50% power, stirring every 30 seconds. Or use a Wilton Melting Pot. 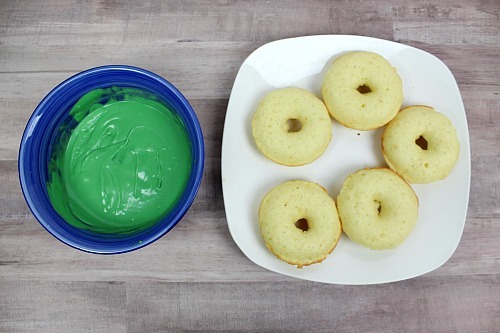 Dip the top of the donuts in the green melts. Let melts harden – usually about 5 minutes. 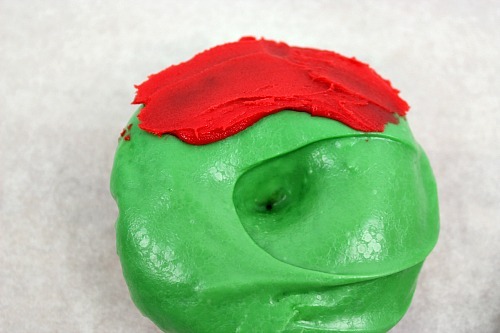 Use red frosting to ice the Grinch’s Santa hat. Use white frosting to frost a line to be the brim of the Santa hat. Place 2 yellow Wilton eyes right below the white brim of the Santa hat. Use your black decorating frosting to make a small dot in the center as a nose and a V below that as the Grinch’s mouth. Let set for 5 minutes, then enjoy!